1.2mm Titanium Labret studs with Resin Coated Sparkly Disco balls, these are very popular for ear piercings or lip piercings. 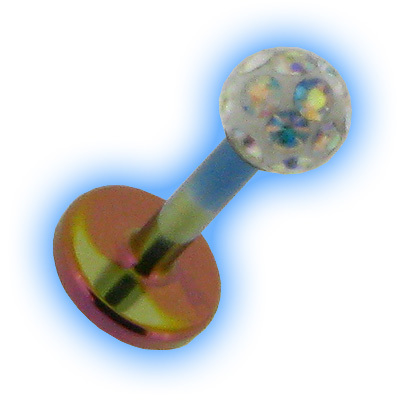 This combination of top quality 6AL-4V eli (Grade 23) Titanium Labret stud with a resin coated glitter ball has been so popular with our customers using our build your own labret feature that we have decided to add it as a product in its own right. The photograph shows a Rainbow Titanium Labret with a Crystal AB ball, but you can choose from 12 colours of Titanium - Highly Polished, Ice Blue, Blue, Bronze, Brown, Yellow, Peach, Pink, Purple, 2 Tone Purple Blue, Teal, or Rainbow! The balls are available in either 3mm or 4mm and are available with 12 different colour chioces - Clear, Crystal AB, Red, Pink, Sapphire, Aqua, Peridot, Blue Zircon, Amethyst, Emerald, Fuchsia or Multicoloured. The studs are 1.2mm (16g) and are most commonly worn in ear piercings, lip piercings or as monroe studs, they look amazing on and because they are Titanium they are light weight and comfortable to wear. We love them, we hope you do too!